Deborah was just nine years old when the deadly tsunami struck the Car Nicobar air base where her father works. Her entire family was displaced due to the natural calamity and she had to spend a whole day on a tree to survive before rebuilding her life from nothing. Deborah has not only reshaped her life but also emerged as the country’s top cyclist.The girl from Car Nicobar has overcome tremendous adversities in her short life to usher India’s finest medal haul at the Junior Asian Cycling Championships with one silver and two bronze in the track races. Cycling was far from her mind when a devastating tsunami hit the Andaman and Nicobar Islands in 2004. “My mother was in the church praying while I was at home with my father, brother and sister when there was the earthquake followed by the tsunami. We didn’t really understand what was going on at that time. As everyone was running into the forest, we did the same. For the next five days we stayed inside the jungle, sometimes clinging on to trees before the rescue team arrived, ” Deborah says, recalling the toughest time in her life. “I had lost my house, my school when the tsunami hit Andaman and Nicobar island. I was in Nicobar, we had to rush into the forest to save our lives. We are four members in the family. I have a small brother,” she recollects. “Government helped to rebuild our house. After that I had to cycle my way to my school. I was involved in other sports such as high jump, long jump, shot put etc but my coach Sensor told me to switch to cycling,” says the 19-year-old. There is a hint of a grin on her face as she narrates the incident, which probably shows that life post that tsunami has taught her to take things in her stride. She counts it as a blessing. “I wasn’t always into cycling. I took part in a lot of athletics, especially long jump events, in school as well as the national level. During one of the high altitude training exercises, the campers were asked to participate in a rope climbing activity to test their strength. While even the men cyclist managed to achieve the target just once, Deborah repeated the feat thrice and the coaching staff was convinced that she was a special one. But for better part of her childhood, cycling was a routine job for Deborah and she dreamed of making a career as a long jumper during her school days. However fate had a different plan for the elder of two siblings. In one of the local games, Deborah brought along her cycle from Car Nicobar to Andaman islands to make up the numbers in that event too and went on to win the competition. The experts and coaches watching her was so impressed with her style that they convinced her to shift from track and field to the cycling track and she has not looked back. Her father has a modest job in the Indian Air Force and is based out of Car Nicobar Air Base. As Deborah moved to Andaman, she hardly got to spend time with her family. “It is not easy commuting between Andaman and Car Nicobar. I spend most of my time in the Andaman SAI Centre and go home only for two weeks during the Christmas holidays, ” she says. 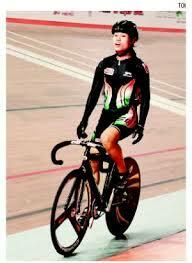 She hit the limelight after clinching her first track gold in the Amritsar nationals in January 2012. Last year, she won a gold medal at the junior national cycling championships before managing a silver medal in the senior category. The 18-year-old can hardly convey how the family coped with the natural calamity in her broken Hindi but the tone of her voice in enough to tell the story of the struggle. 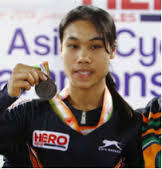 But fighting adverse conditions to not just survive but also carve a niche for herself has been second nature for the girl who grabbed the best medal haul (1 silver and 2 bronze) for an Indian cyclist in the junior category of the Hero Asian Cycling championship in New Delhi. Her communication with fellow campers was restricted to a few pleasantries due to her lack of prowess in Hindi or English. Deborah won two gold medals in the junior category in the 2012 Nationals in Amritsar and has been a regular part of the Indian squad since then. The Cycling Federation of India (CFI) has now been forced to sit up and take note of the juniors’ performance and is now keen to develop it keeping in mind the 2016 Rio Olympics. “We have proposed that some of the juniors, including Deborah, should be sent to the UCI Academy in Switzerland for training. It costs about 4, 000 Swiss Francs a month and we have sent a letter to the sports ministry and SAI in this regard. Their phenomenal showing in this Championship should convince the authorities to help us out, ” reveals a CFI official. In fact, CFI secretary general Onkar Singh believes Deborah has the potential to be the face of Indian cycling in the near future. “If she is provided the right opportunities to prosper, Deborah can potentially achieve what SainaNehwal has done for Indian badminton, “Onkar says. Given the right support, Deborah can not only manage to achieve far bigger feats but also be a role model for many youngsters from remote parts of the country to take up cycling as a sports career. From ashes to greeeneries…… like Phoenix.